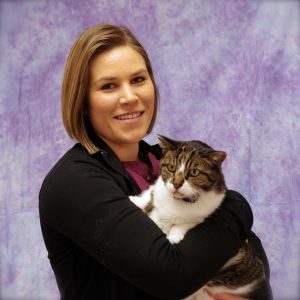 Ali earned her AAS degree at Duluth Business University in 2009 and has been at Smith Veterinary hospital since 2008. She especially enjoys the reproduction aspect of working at SVH. Ali shares her home with her zoo consisting of two cats, Clementine & Chip, a Danikk Labrador Brutus & a Boxer Tank. In her spare time she enjoys trying new restaurants, traveling, but most of all spending time with her family, friends and animals. Talisha began working at Smith Veterinary Hospital in April of 2018. She obtained her AAS degree in Veterinary Technology from Globe University in Woodbury, MN in March of 2013. She enjoys performing venipucture, dental cleanings, and assisting in surgery. She shares her home with a 14 year old cat named Fluffy. When not working, she enjoys shopping, traveling and being with family. Carissa began working at Smith Veterinary Hospital in July of 2018. She recently moved here to Minnesota from California with her husband. She has been working in the veterinary field for 5 years and has always had a passion for animals. She has recently adopted the clinic cat, Sandskie, who has quickly become part of the family. When she isn’t at work she enjoys outdoor activities, watching movies and helping her husband run his company. Nicole joined the Smith Veterinary Hospital team as a receptionist in February of 2017. She has worked in the animal industry since 2014 but has had a passion for animals since she was a small child. At work Nicole enjoys assisting the technicians and doctors with appointments and seeing all of our clients and their pets! Nicole has a 3 year old Golden Retriever named Athena who takes up most of her time outside of work. When she’s not at work she enjoys watching Netflix, the Minnesota Wild and the Green Bay Packers. Colleen started as a Receptionist at Smith Veterinary Hospital in July of 2018. She studied biology at the University of North Dakota. She loves to help out with all of the pets that come into the clinic! Outside of work she enjoys spending time with her family and friends, especially the furry ones. She has 4 pets at home 2 cats, named Mario and Abby, and 2 dogs, named Josie and Turbo!